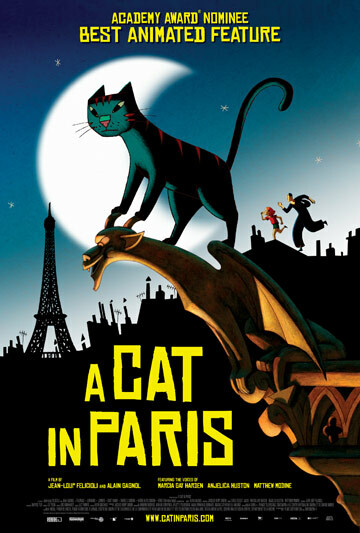 I've been wanting to see the French animated comedy, "A Cat in Paris," ever since it was nominated for a 2011 Academy Award in the category of Best Animated Feature. While the film, which is about a cat named Dino who leads a double life as a child's pet and a dangerous thief, ultimately lost out to Johnny Depp playing an animated chameleon named "Rango," cat culture addicts like myself still held out hope that the accolades it received would lead to a stateside release. Luckily for us, indie film distributor GKIDS recently announced plans to bring the movie to the U.S, with an all-star cast of actors such as Marcia Gay Harden, Anjelica Huston, and Matthew Modine lending their vocal talents to the English dub. "A Cat in Paris" will be released in New York and Los Angeles on June 1, with additional dates in other major cities scheduled to follow throughout August. Now, all that's left to do is perfect your cat hairdo and save up your popcorn money, after checking out the movie's official Facebook page for the list of updated theaters and details.